It’s hard to believe that our clinic debut was not even a year ago! On Feburary 6, 2013 we pitched for the first time at the Open Door Community in Atlanta. It has been a tremendously exciting year, and we hope this is just the beginning of a long and healing journey. At our Atlanta hub we hosted 17 clinics, where we served gallons of seasonal tea blends, conducted 111 consultations, dispensed 2 1/2 gallons of customized tincture formulas (alcohol and glycerites), 8#’s of raw custom herbal and powder blends, and a variety of other remedies including essential oil sniffers, herbal capsules, and oil rubs. We facilitated several pop-up first aid clinics around the country, including the Rainbow Gathering in Montana, the Firefly Gathering in North Carolina, the Southeast Women’s Herbal Conference in North Carolina, and the Georgia Organics Conference in GA, where we served hundreds more and put herbal healing in the hands of the people. 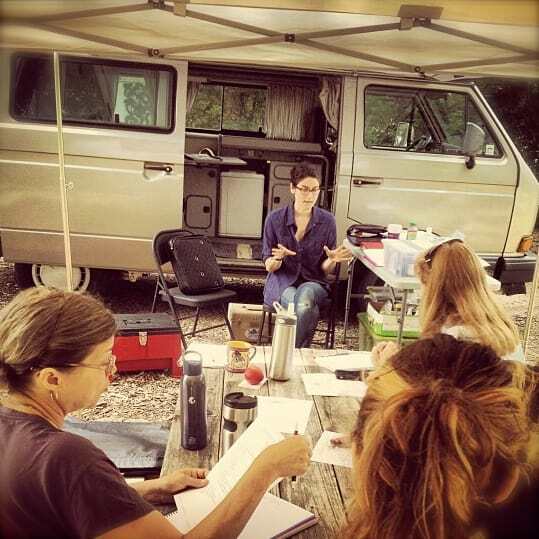 We spread the Herb Bus method and our love for plants and community at numerous classes and workshops. Some of our hosts included Ponderosa High School, the Blue Ridge School of Herbal Medicine, Warren Wilson College, Homestead Atlanta, and the High Museum of Art. 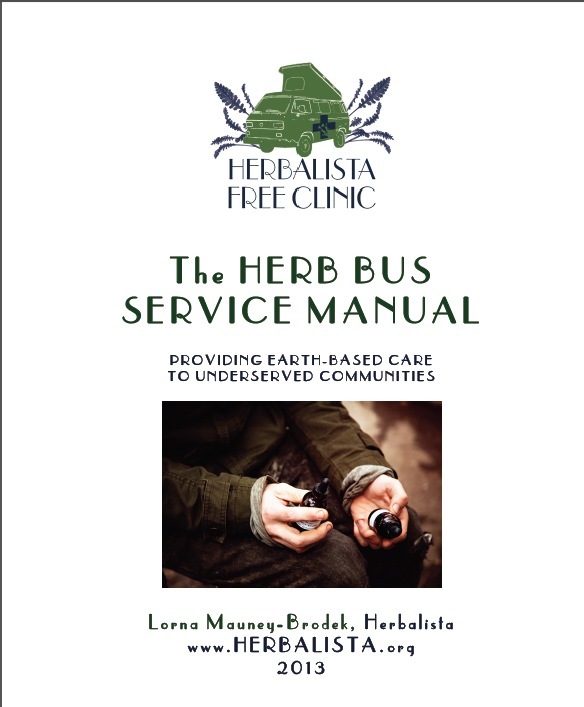 We created the Herb Bus Service Manual to help others start free clinic projects in their communities. This manual is available as a free PDF download from our website. 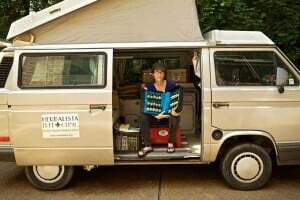 Lorna, the herbalista who drives this sweet ol’ bus around town, was awarded the 2013 Community Service Award by the American Herbalists Guild to honor her work with the Herbalista Free Clinic and the Harriet Tubman Free Foot Clinic. 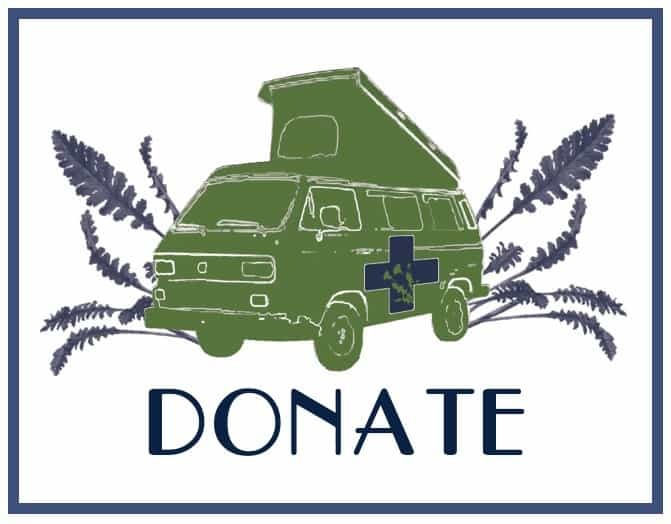 The Bus drove over 10,000 miles delivering healthcare and herbal education around the country. And, saving the best for last, we spent time with the plants– studying their form, learning their energetics and actions, and wildcrafting to prepare sweet sweet remedies to share with our patients and community. Thanks to our community who supports this work, our teachers who inspire us to grow and strive, the plants who heal, and the people who receive these gifts with grace. Viva la Herb Bus! Neither wind, nor rain, nor snow, nor downright COLD, keeps us from our appointed rounds. January 8, 2014, Open Door Station, Atlanta. This past year was an incredible journey. As 2013 took her first breath, the Herbalista Free Clinic was merely a whisper in my head and a hope in my heart. Since beginning our rounds that sunny and crisp February afternoon (captured in this photo by Jessica Horwitz), we now have two established regularly serviced stations in the Atlanta area, at which we have held 16 clinics, provided over 100 consultations, and abundantly dispensed sweet, sweet herbal remedies. We helped to facilitate free first aid clinics at gatherings in states around the country. 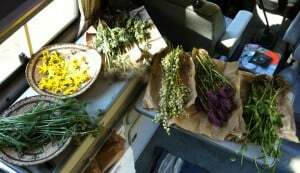 We led plant walks, taught workshops, and ten trained other herbalists on our model using the Herb Bus Service Manual. 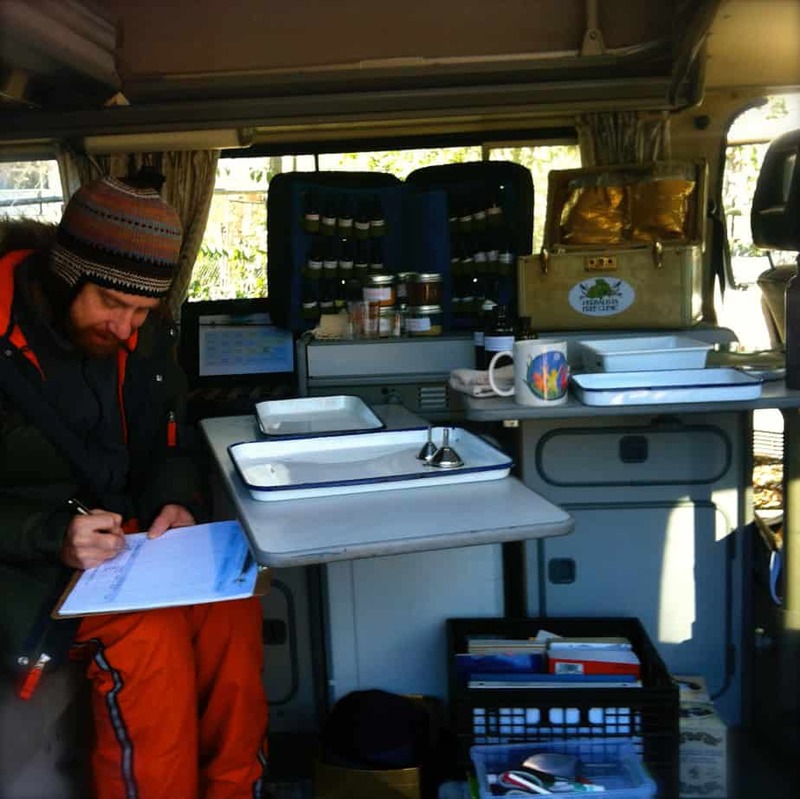 In December we welcomed a new apotheker to the Herb Bus crew! Corinne returns to Atlanta after spending the last year homesteading in North Carolina. During her stay in the mountains, Corinne helped wildcraft medicines for the bus, and now that she has returned to the city, she will be heaping to place those healing remedies in the hands of the people. And as we travel these forbidden roads of free, earth-based medicine in a for-profit-pharma-surgically-controlled-country, we have discovered a most verdant underbelly. For while forbidden, these roads are anything but lonely. There is an ever growing number of dedicated healers, inspired teachers, generous medicine makers, and gifted facilitators, working to serve in their communities. We are grateful for their company and inspired by this shared vision of collaborative care for all earth’s children. Here’s wishing you a New Year filled with bliss, purpose, and herbalistic voyages!